Please do me a favor right now: Please bookmark the main Jesus and the Kingdom Bible Study page so you can find it again easily. 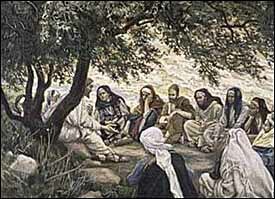 Jesus' parables centered on the nature of the Kingdom of God. His first public message was, "Repent, for the kingdom of heaven is at hand." But what is this kingdom that Jesus taught? What is it really? How does it relate to your own life? We're exploring Jesus and the Kingdom of God in a 10-week Bible study. As of Nov 13, 2010, 6,468 people from 148 countries had signed up to be part of this. "Informative, uplifting, spiritually satisfying." -- Jesus Canon, Jr. This is our 34rd online Bible study since 1996. If you've participated in one before, you know how God can use them in your life. If not, then you have a treat in store for you. This is an cross-denominational study designed to help you grow as a disciple of Christ. -- Dr. Ralph F. Wilson. About the leader. You can respond to the questions and exercises using the Joyful Heart Bible Study Forum -- and read others'answers to reinforce your own understanding. The book is now available in e-book format and paperback formats.